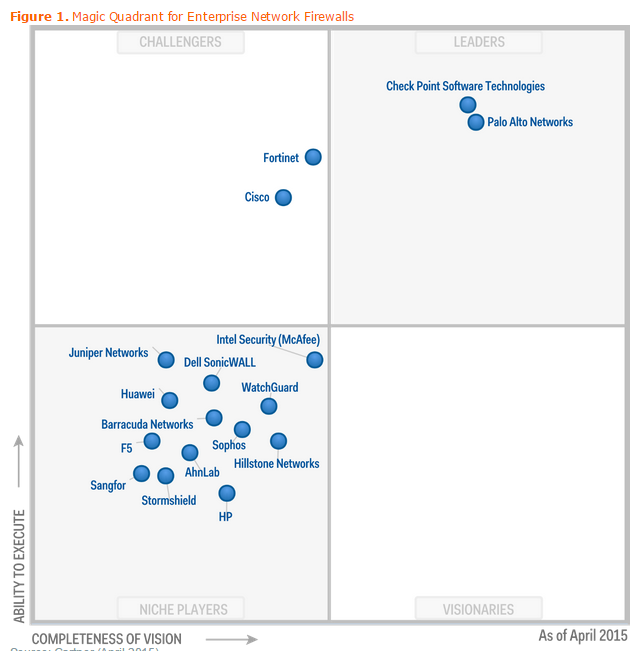 FYI, as of April 2015 from Gartner. Fortinet...really? Up with Cisco? Interesting...I worked with one of their firewalls a number of years ago, and I was not impressed. But perhaps they have made improvements since then. Yeah, I'm not impressed with fortinet or Cisco at this point. It's check point and Palo for the real next generation firewalls today. I have to agree with you Shane...I've been using Cisco firewalls for many years and they are not keeping up with Checkpoint or Palo. And I'm not sure why...Cisco sure has the brain power and resources to throw at the firewall line, but their efforts thus far are weak. I guess they are more focused on the Data Center and Carriers.